Discover is a highly-recognized name in finance. As one of the major credit card corporations, Discover is well aware of how the financial world runs, and it brings this knowledge to the table in its loans platform. Providing fair terms, reliable service, and strong borrower resources, this lending institution is an excellent choice for those seeking an alternative option to the more nondescript lenders with less credibility and backing in the industry. Strict eligibility terms and close attention to credit history make it somewhat more difficult to get accepted for a Discover loan, but lack of fees and excellent service make the fight worth your while. Discover takes credit history heavily into consideration when deciding whether or not to approve someone for a loan. As such, borrowers with a healthy record of borrowing and debt repayment will fare well with this company. Discover gives close to 70% of the loan directly to the creditors being paid off. This way, borrowers are assured that the debt is taken care of. Discover has many benefits that make it appealing to any lender. For one thing, repayment plans range from 3 to 7 years, so you have a lot of flexibility in regards to how long you can stretch out your monthly payments. Additionally, Discover offers fixed interest rates. Many borrowers are more comfortable with this option as it is a guaranteed rate that will not be affected by market fluctuations or other factors. Two very impressive features that Discover is able to offer customers involve repayment flexibility, as well. The first one is the lack of repayment fees that will be discussed in further detail below. The second benefit is something that truly allows Discover to stand out amongst the crowd of lenders because it is the only institution to offer such a boon. The 30-day money back guarantee is an amazing offer. Essentially, Discover promises that a borrower has 30 days to return their loan if they change their mind for any reason. The 30 days start from the time of signing, and borrowers will not incur any penalties or fees, and they will not even be required to pay any interest. The loan is completely cancelled. This is completely unheard of in the world of loans, and it gives Discover a tremendous edge above the competition. It is not the easiest feat being approved for a Discover loan. Your debt-income ratio, credit score, and credit history will be closely examined, so those with a checkered past or insufficient credit history may have a difficult time with approval. That being said, Discover loans are some of the most lucrative in the industry, so it is certainly worth trying for. Because it is a direct lender, Discover's terms are clear, straightforward, and competitive. Additionally, this lender is available in all 50 states, something most of the competition cannot claim. 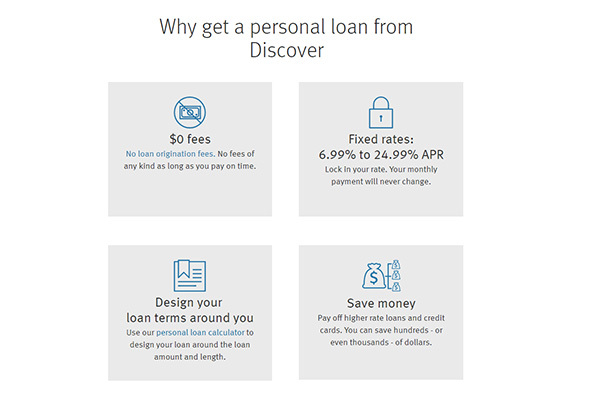 Discover also has several unique benefits, one of which is its green loans offer. Homeowners looking to upgrade their properties for more Earth-conscious choices can take out loans with better terms. Some examples include solar or geothermal panels that reduce energy consumption. Discover has a simple online application process. Potential borrowers fill out the online form, answering basic questions such as name, requested loan amount, and bank details. From here, Discover assesses credit history and decides whether or not the applicant is suitable for a loan. If so, a loan proposal is sent. If all the information is accurate, loans can be processed as early as the same day. Discover has excellent loan terms. APRs range from 6.99-24.99% and repayment plans can be arranged for anywhere from 36-84 months. The minimum household income is $25,000, though on average, Discover borrowers make more than this. The same is true of the credit score. While the minimum Discover will work with is 660 (or in some rare cases 580), most loans go to people with credit scores of at least 740 or higher. Fees include a late payment fee of $39 and a returned check fee. However, Discover doesn’t charge any other fees that are common to the industry such as an origination fee, balance transfer fee, or check processing fee. Another generous benefit to this lender is the lack of prepayment fee. Many lenders will charge borrowers a fee if they choose to pay off part or all of their loan earlier than agreed upon. This is because the lender loses out on the interest payments they would have received if the loan had run its full course. Discover does not charge any prepayment fees, so borrowers with a healthy financial standing can pay off their debt faster than anticipated without penalty. Additionally, Discover allows borrowers to switch their monthly payment dates twice throughout the course of their loan. This is another flexibility that is not afforded by most lenders. While there is no set policy, borrowers who know they will have trouble making a repayment can contact Discover and discuss deferment or alternate payment plans. 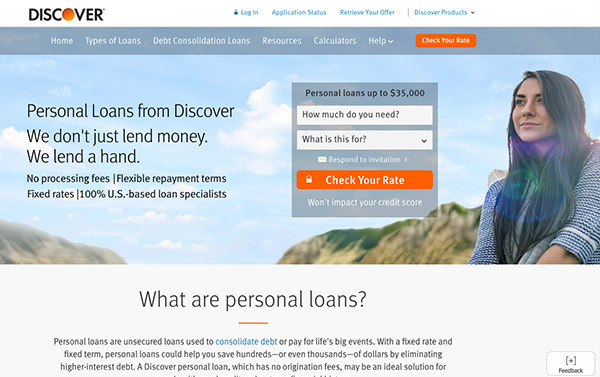 Discover is an incredibly safe bet for borrowers to rely on. Aside from having decades of experience to back up its claims and a reputation across the industry for being fair, reliable, and of unquestionable character, Discover’s policies show it to be safe and dependable. Policies including flexible repayment terms, money back guarantee, deferment plans, and guidance, which we’ve discussed already in the review, highlight this company’s commitment to fairness and decency from start to finish. In addition, Discover employs several safety protocols to keep their payments, information storage, and transactions safe and secure. Safety measures include Symantec Norton Secure protection on every page of its website, 24/7 monitoring, login security, and membership with the FDIC. Discover has recently updated its support services, bringing it to the forefront of customer care with the latest technologies available for assistance. Borrowers can reach a knowledgeable customer support representative via live chat or 24/7 toll-free phone numbers both within or outside the United States. What’s more, Discover is a financial institution and as such understands the world of finance more than most. For this reason, it provides customers with several in-depth resources to help guide them through the borrowing process and understand more about finances in general. Discover features a wide range of FAQ sections on its website in addition to an articles library with informative posts about financial matters. It also offers loan calculators to help borrowers understand exactly how the repayment terms will break down from month to month. 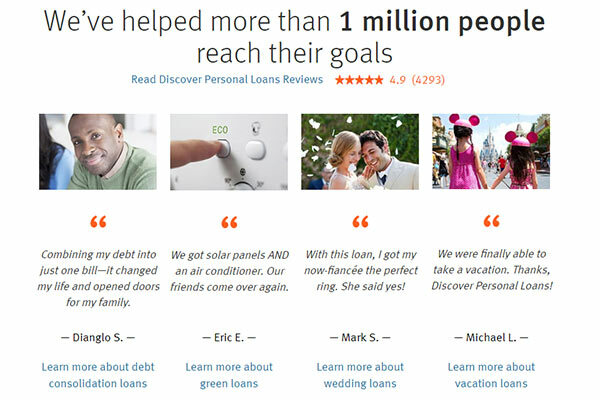 Discover is a strong lender with one of the most solid reputations in the financial industry today. This makes it an automatic contender for best loan provider for just about anyone who is looking. Discover’s loan terms only solidify these claims, with flexible repayment terms and understanding payment policies. The 30-day money back guarantee makes this company shine brighter than the rest, and the significant lack of fees only adds value to the already appealing offer. Customers will need to show a reliable credit history in return for these benefits or at least prove to Discover that they are capable of responsibly paying off their loan in a timely fashion if they want to be approved. If approved, however, borrowers can look forward to a pleasant, comfortable, and easy loan experience from this prominent name in lending.